I'm all about Italy. All the time. When we traveled there, I knew that's how I wanted to live the rest of my life. Especially their food philosophy. Meals were a gathering. The restaurants, owned by families, opened at 7 or 8, and once their tables were filled, they kindly let people know that they would not be serving anyone else that night. Because a meal takes at least 3 hours to get through. Sure, there are a ton of different courses served, and plenty of time to rest in between. But mainly because meals were a time of communing. To relax, have some wine, catch up with your loved ones and some people you might not know, and just enjoy life. And the food was phenomenal. So this is one of our faves. We do this about once a week- basically as often as I make baguettes, or other fancy pants bread. Because first off, there is nothing better than fresh baked baguettes right out of the oven, and why ruin that with other food? 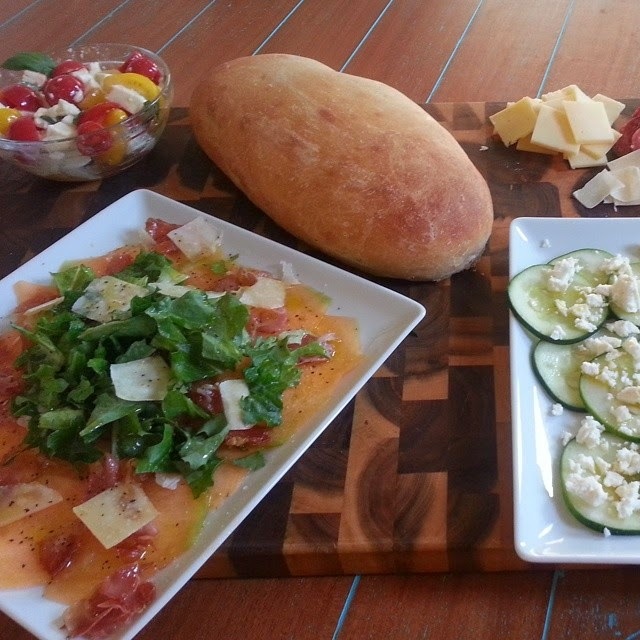 Let the bread be the star, cut up some cheese and veggies and HAVE AT IT. I might currently be in a bread coma from tonight's meal. But so is the rest of my household so it's all good. So let's break this bad boy down. The bread. It's called Pain de Campagne Poilane ("Pierre & Lionel Poilane are the most celebrated of Parisian Bakers" and this is their most celebrated bread) and the recipe is in Bernard Clayton's New Complete book of breads. This recipe takes 3 days to make (make the starter, wait a day, make the sponge, wait a day, then finally make the bread on day 3). So I'm not gonna type out the recipe. Also because I have a feeling that's some kind of copyright infringement. Let's just say that if you want to ever make bread you NEED to own this book. Because it has everything. The best bagels I've ever tasted, the best hamburger buns, the best baguettes, the best sandwich bread......you get the idea. So buy it. Anyway, this is super fancy pants bread cause it takes so long, and you get 2 of those sized loaves out of it so WORTH. IT. The other semi star in this pic is the melon carpaccio- Mario Batali's recipe, here. I stuck to the recipe written except I used prosciutto that I crisped up in a skillet instead of salami because I've had cantaloupe and prosciutto before and it's an amazing pairing. And I didn't have arugula so I used whatever greens I had in my fridge. I think the arugula would have put it over the edge so I'm kinda bummed I didn't just send the hubbs out for some, but it was still amazing. Like I could eat that salad every night amazing. And yes, I'm totally counting that as a salad. Carpaccio, by the way, is simply raw, thinly sliced whatever. There's beef carpaccio which is the bomb, there's octopus carpaccio which I will not be eating anytime soon, etc etc. The other stuff. One is a cherry tomato, basil and buffalo mozzarella salad. Also known as caprese, I just threw it in a bowl instead of making it all pretty. Throw some sea salt and evoo on it and you're good to go. Sliced cucumbers with french feta cheese and evoo. Also yumtacular. And then of course sliced assorted cheese and salami. Because.